NAWN 1607161AM3 Boston Spa Festival Weekend. 1607161AM3. A seed of an idea that was sown in a gardening event has blossomed into a huge success. The first Boston Spa Big Weekend Festival, organised by David Watts of Boston Spa, drew crowds which far exceeded the organiser’s expectations. NAWN 1607161AM7 Boston Spa Festival Weekend.Gwilym and Sylvia Jones enjoy afternoon tea with one of the scarecrows.1607161AM7. “The idea grew out of the open gardens we held two years ago,” Mr Watts said, referring to an event organised by Boston in Bloom. 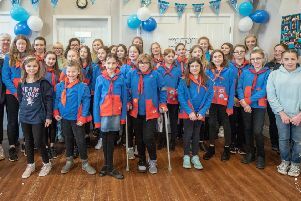 “We thought it would be good to have a weekend of activities, with various groups participating, but without a central committee – rather, each group was doing its own thing, raising funds for its own cause, etc. Starting with the scarecrows that went up a few days before the weekend, the events included a classic car rally, various concerts, a scout event, the Methodist Church’s Flower Festival, village walks, with local restaurants providing street food on Saturday. NAWN 1607161AM1 Boston Spa Festival Weekend. Sue Jakeman and Judith Grimditch. 1607161AM1. A total of 18 organisations took part in the event and the 11 open gardens on Sunday drew over 500 visitors, said David. Tea and coffee was served in the Village Hall and at Deepdale to refresh visitors. “It is hoped that the event can be repeated annually or bi-annually, with even more participation by local organisations and businesses,” added David.